By Tim Norsten. Tim is a Certified Hereford Beef regional brand manager and chef. Have you ever heard of Sauerbraten? This hearty meal has it’s roots in Germany, where Sauerbraten means “sour roast.” This meal gets its name because of the vinegar and spices used to marinate the beef days before it is cooked. This is a great recipe to utilize our Certified Hereford Beef top round roast in a new and different way. 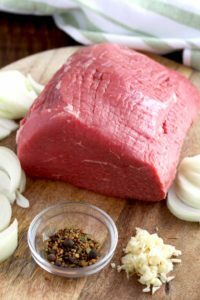 Sauerbraten would be perfect for a weekend special, especially paired with a German wine or beer! The recipe I am sharing has been in my mother’s family for centuries. In fact, this recipe came overseas to Minneapolis with my Mother, Maggie “OMA” Norsten, when she moved from Wurzburg, Germany, to Minneapolis in the early 1950’s and married my Father. I have enjoyed this German-style roast beef dinner hundreds of times, and never had a meal that was less than fantastic! 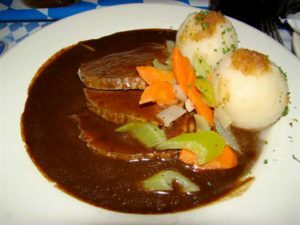 Sauerbraten is regarded as one of Germany’s national dishes and is frequently found on menus in Minneapolis and around the country that are authentic German-style restaurants. Be prepared – it will take five days to prepare the Sauerbraten the Authentic German-Style way. I can promise you, though – it is worth it! Here is our family recipe – we hope you will enjoy. 1. Wipe the Certified Hereford Beef roast with a cloth to remove any excess juices from the meat. Sprinkle the meat with one tablespoon of salt and pepper to cover the Certified Hereford Beef roast. Add one ounce of olive oil to the bottom of a large bowl and place the meat inside. 2. 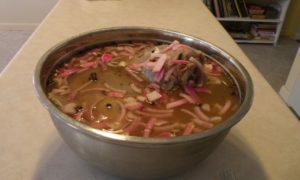 Add sliced yellow onions, carrots, celery stalks, two to six cloves to taste, two ounces of peppercorns, 2/3 cup of red wine vinegar, bay leaves and 4-5 cups of water. You should add enough water to cover the meat. Refrigerate the meat and marinade mixture for four days in a covered bowl. 3. On day five, remove the meat from the refrigerator and wipe down with a towel to remove the excess marinade. Strain and save the marinade solution for a gravy mixture. 4. Place meat into a dutch oven or large baking dish with cover. Massage one ounce of olive oil and three tablespoons of warm, unsalted butter into the meat. Brown the meat on all sides to give the roast a brown crust – turning when needed. Add the strained marinade to meat and bring to a simmering boil. Remove from heat and cover the dutch oven. Place into a pre-heated 300 degree oven for 1.5-2 hours, or until the internal temperature of the roast reaches 145 degrees. Remove from the oven and leave the Sauerbraten covered on top of the oven. 1. Melt 8 tablespoons of unsalted butter in a large skillet on medium heat. Stir four tablespoons of flour and one tablespoon of brown sugar into the melted butter. Stir constantly until the mixture becomes a thicker, dark color. 2. Add the mixture to the Certified Hereford Beef roast in the dutch oven and place back into the oven to heat for 15-20 minutes. 3. Remove from heat and remove the meat from the dutch oven and set on a platter to cover. Leave the gravy mixture in dutch oven. Add eight crushed ginger snap cookies to the gravy mixture and stir to dissolve cookies until gravy is thick and smooth. Strain gravy into a boat or bowl. Sauerbraten pairs wonderfully with German potato balls. Enjoy the recipe for this side dish below. 1. Peel potatoes and quarter. Place into a pot of boiling water and cook for 20-30 minutes, until potatoes are soft enough to mash. Drain potatoes from water and mash potatoes completely in a large mixing bowl. 2. Beat three egg yolks, three tablespoons of cornstarch and three tablespoons of farina into the potatoes. Add 1/2 teaspoons each of salt and pepper. Add 1/3 teaspoon grated nutmeg. Mash the potato ball mixture into a firm, blended texture. 3. Roll potato ball mixture into tennis ball sized balls. Place a couple of croutons into each ball and re-seal. Roll potato balls in enough flour to cover each ball. It will get sticky! 4. In a large boiling pot of lightly salted water, slowly add one potato ball at a time into simmering water. Reduce heat to low when all potato balls are in the pot. Cover pot and poach all potato balls in water for 20 minutes, or until firm. Once you are done cooking the roast and potato balls, place the cooked Certified Hereford Beef roast onto a serving platter, with the potato balls surrounding it. Cover the beef roast with the vinegar beef gravy and garnish with chopped parsley. This meal is fantastic to serve with your favorite vegetables. Carrots, celery and zucchini all pair wonderfully with this dish! Sauerbraten pairs well with any German-style beer and/or bottles of red wine from the Rhone region of Germany. We hope this meal inspires you to incorporate the German culture in your home and menus!